Bready or Not has featured a whole lot of sweets in recent weeks. 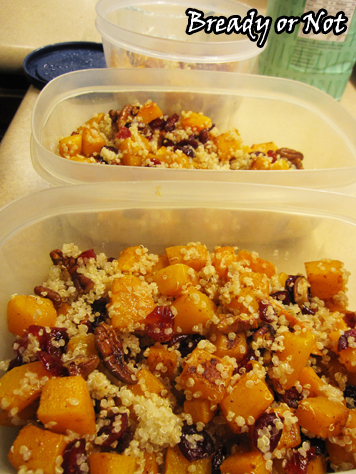 Let’s switch to something delicious and healthy instead: Butternut Squash and Quinoa Salad. This still has a little bit of sweetness going on. 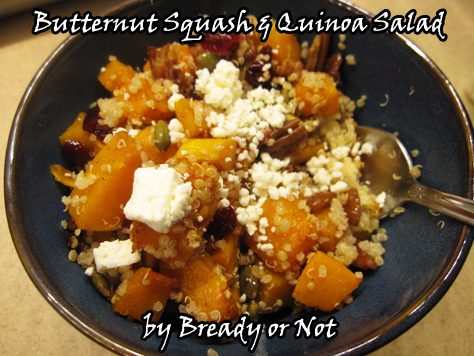 Butternut squash is naturally awesome that way, and a sprinkling of cranberries adds some extra oomph. 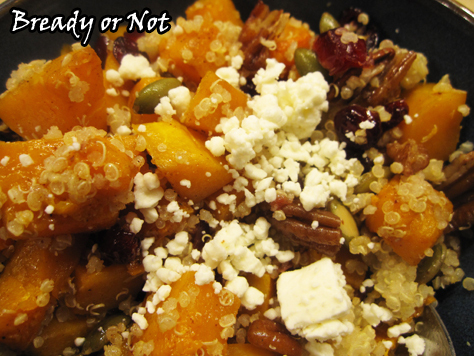 Add some pecans for crunch and feta because CHEESE, and this creates a bowl of happiness. The quinoa adds protein and kinda enjoys the ride along with all the other flavors. I cobbled this together from several other recipes. I wanted something that I could invest some time in and then use as a quick-fix dinner for several more days. I parcel it into three or four containers, depending on the size of the squash, and my meals are set! Or, you could use this as a gluten-free main dish or side dish to feed a group. I can offer a few useful tips, too. I cook quinoa in my Zojirushi rice cooker. One cup of uncooked quinoa makes a LOT once its cooked, more than my salad recipe requires, but cooked quinoa keeps well in the fridge and can also be frozen and thawed weeks later without any issue. If you’re intimidated by cutting butternut squash, there is a safe and easy way to do it! 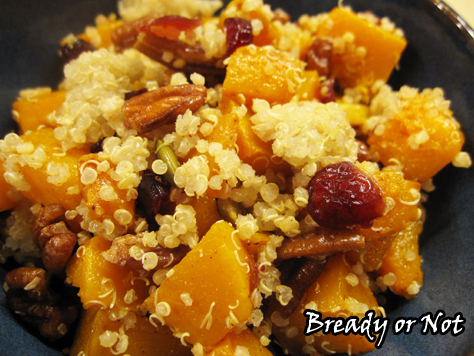 Next week’s Bready or Not officially kicks off my October-November tradition of pumpkin and autumn-themed recipes! Time to bust out the stretchy pants. A Bready or Not Original! This salad takes some initial work to assemble, but it creates a big bowl of autumnal deliciousness! Serve as a main dish or side dish for a crowd, or use it as a solo meal over several days. This is gluten-free, healthy, and full of happiness. Preheat the oven at 425-F.
Line a rimmed cookie sheet with aluminum foil. Spread out the chopped squash and drizzle with oil. Sprinkle spices of choice and some salt. Roast squash for 20 minutes. While the squash is roasting, measure out the cranberries and place in a small bowl. Cover the cranberries with water and let them soak. Measure out the pecans. When the 20 minutes is up, toss the squash in the pan. Drain the water from the cranberries, discarding water. 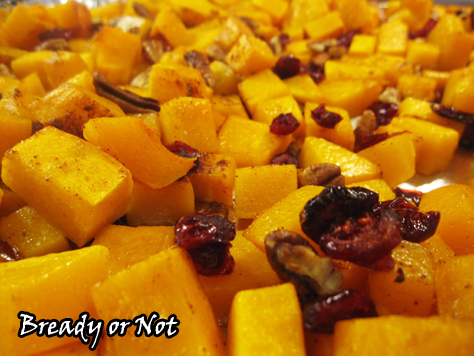 Add the plumped cranberries and pecans to the squash, and season more, if desired. Cook another 10 minutes or so, until butternut squash is fork tender with roasted coloration. Transfer the pan's contents to a large bowl. Gently stir in the quinoa. Serve hot or stash in fridge for later, and heat with microwave. Add sprinkle of feta just before serving.